It’s become commonplace: our highest court gets involved in the internal affairs of political parties. This week the gauntlet fell on two more: Bandera Roja (Red Flag), a once guerrilla group that decided eventually to replace the armed struggle for the electoral one, and Christian Democratic party COPEI, one of the main Venezuelan political parties of the pre-Chavez era. On Tuesday, the TSJ’s all-powerful Constitutional Hall decided to give full control of BR to chairman Pedro Veliz Acuña, including the right to select candidates for the upcoming AN election. But the Constitutional Hall didn’t stop there: hours ago, the magistrates accepted a request from several members of COPEI’s National Political Directorate, who complained about a lack of consultation in the selection of candidates for the legislative election. Therefore, they named an “ad hoc” board (involving those behind this request) and told the CNE to only accept COPEI candidates from this board. What’s behind the Bandera Roja case? Veliz was selected as BR’s chairman in its 2011 internal congress, but the following year that process was declared void in another congress, which left the party in hands of its founder and current Secretary-General Gabriel Puerta Aponte. In 2013, the TSJ’s Electoral Hall ordered a new internal process and the case eventually strahgt up to its Constitutional counterpart. In November of last year, the case was declared as “terminated” and the Electoral Hall’s prior ruling was thrown out. Chavista despotism and their united mafias, through the TSJ’s Constitutional Hall, just took away Bandera Roja’s electoral card and gives it, as some exchange currency, to a little character without any profession known since quite some time as a government agent, and who’s assuming the condition of impostor on a political party that resumes a good part of the history of the Venezuelan revolutionary movement and represented in the acronym BR. 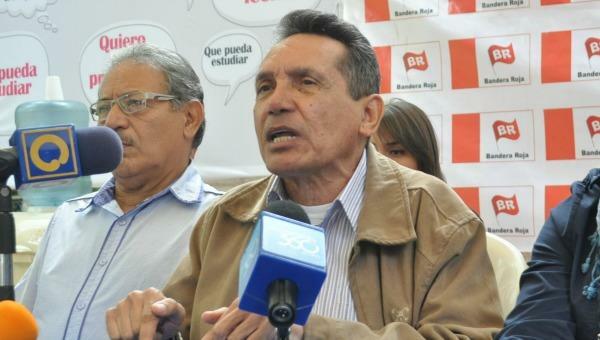 Bandera Roja’s Secretary-General Gabriel Puerta Aponte told news website El Pitazo that Veliz was originally selected only as a honorary chairman, because of his role as a former guerrilla fighter and that it’s up to his post to make to register candidates for all elections. The relationship between BR and the MUD hasn’t been easy: last year, Puerta announced that Bandera Roja was leaving the MUD, which was denied shorty after by the opposition coalition (with the support of Chairman Pedro Veliz). And more than two months ago, Puerta said BR would go to December’s legislative election with its own brand, regardless of a possible agreement on the use of a MUD Unity Card. As election time approaches, judicial pressure on political parties is intensifying, as both these cases and last week’s MEP-jacking can attest. Even the first party involved in a similar case PODEMOS is not safe: the Constitutional Hall ordered in June “a provisional structure” to run such party until the December 6th election, lead by former Aragua State governor Didalco Bolivar. An effective way to keep them on check.